Above: Limiting the speech of victims of police misconduct is unconstitutional, inhibits reform and hurts the community, activists plan to say, at a rally and forum today in Baltimore. They’ve got the Washington Post, BuzzFeed and 18 other media organizations on their side. 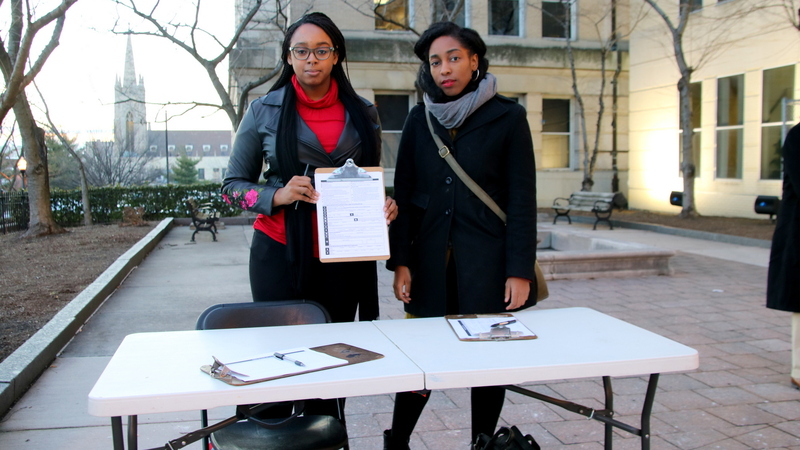 They’ve also got the Howard University School of Law and the Washington Lawyers’ Committee for Civil Rights. The groups that represent the primary victims of police violence – African American men, women and their families. One of them, who will be speaking at a rally outside of City Hall at 5:30 p.m. today, is Tawanda Jones, the sister of Tyrone West, who died while in Baltimore police custody in 2013. A strict confidentiality agreement – a so-called gag order – was one of the conditions of her brother’s family’s $1 million settlement in the case. Like others who accept payments to drop their lawsuits charging Baltimore police with misconduct, the family could not speak about the case. Jones refused to be part of it and did not sign the agreement. “If I was to be silent about what happened to my brother, I would probably be in the hospital right now. 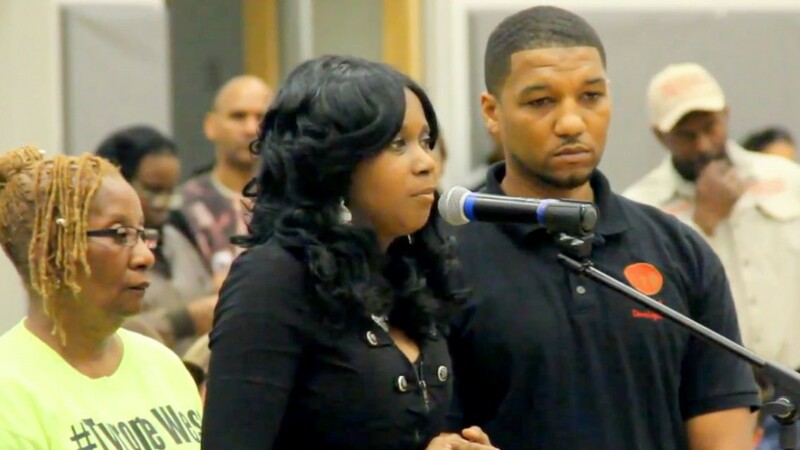 Talking about it helped me gain strength,” said Jones, who has been fighting since her brother’s death to have the police officers involved held accountable. Other victims of police violence, Jones said, have told her about the personal cost of that silence. “The fact that they can’t even talk about what happened to their loved one as if they’re supposed to just move on? That’s utterly ridiculous,” said Jones, who has been holding weekly protests – “West Wednesdays” – since her brother’s death. “Some of them have died, literally left out of this world, with no justice, no peace, no accountability, no nothing and it’s horrible,” she said. Among the groups who will join the ACLU at today’s rally and at a 7 p.m. public forum at the War Memorial Building are The West Coalition/Justice for Tyrone West, Not Without Black Women and Runners4Justice. • The Mayor’s Office and Baltimore city government must immediately cease including gag orders on all police abuse settlements. • The City Law Department must release information about how many gag orders have been attached to past settlements, broken down by year. • The City Council must hold a special hearing on Baltimore’s use of gag orders. • The City Council must pass a resolution calling for the all past gag orders in police misconduct settlements to be null and void. “These gag orders force those who have already been victimized by police abuse to trade their First Amendment rights for a monetary settlement,” Goode said. The city loses out as well because transparency is essential if Baltimore hopes to repair the tattered relationship between residents and police, she argued. “Gag orders silence victims, denying valuable victim input in police reform efforts and causing history to be lost when people cannot tell their stories,” Goode said. The 2017 lawsuit behind today’s event was filed by the ACLU on behalf of Ashley Amaris Overbey and The Brew. 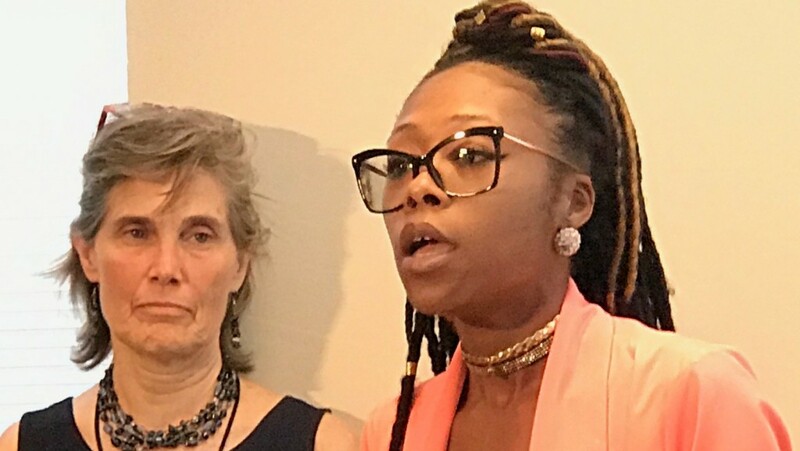 The suit alleges the city improperly denied Overbey half of her settlement award after she responded to comments online about her experience of being brutalized by Baltimore police. Overbey, who had called police seeking help for a breaking and entering at her house, said officers “slapped, punched, beat and tased her,” arresting her on charges that were later dropped. The suit also alleges that so-called “gag orders” unconstitutionally hamper the reporting efforts of The Brew and other media organizations. Additional arguments are made in amicus “friend of the court” briefs. Reporting on cases like Overbey’s, one of them argues, is especially important in light of the history of police violence in America, disproportionate use of force on black residents and the history of police violence against black women. “Educating the public about violence against Black women proves difficult because mainstream media rarely discusses it,” says the brief filed by the Baltimore-based Public Justice Center, the National Women’s Law Center and Tawanda Jones. The plaintiffs are appealing to the Fourth Circuit from a Maryland district court decision dismissing their constitutional challenge to the gag orders. The appeal is scheduled to be heard in Richmond on October 30.